The Foundation for Visual Arts, in ongoing collaboration with the Zofia Rydet Foundation, the Museum in Gliwice, and the Museum of Modern Art in Warsaw, has embarked upon an ambitious archival project dedicated to the preservation and dissemination of Zofia Rydet’s seminal “Sociological Record” (Polish: “Zapis socjologiczny”) cycle in its entirety. Zofia Rydet’s “Sociological Record” (realized between 1978–1997, with the archive’s main material dating from 1978–1990), represents one of the most important achievements in 20th-century Polish photography. Of canonical significance, the “Record” has nevertheless remained something of a challenge for scholars and art critics alike, owing to the sheer breadth of the project’s scope and Rydet’s prolific industriousness. 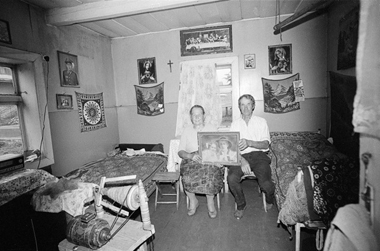 Rydet (1911–1997) assembled her photographic “Record” by systematically and methodically documenting the lives of individuals depicted primarily within the literal frame and context of their homes: village huts in the countryside or else apartments suspended amidst blocks of city flats (the urban portion of the “Record,” it should be noted, remains relatively obscure and unplumbed to this day). Exercising formal consistency and typological rigor, Rydet would apply the same compositional frame and organizing principles to her “Sociological Record” investigations from year to year and decade to decade: occupants, seated, facing the camera, backs to an interior wall, often with their hands resting in their laps (palm over wrist or thigh or knee or cane, or else knuckles curled into palm). Infirm subjects emerge from beneath quilts. A cradle rocks. A curtain billows. Children and dogs occasionally lean into a frame from a room’s periphery or, in the case of the former, allow themselves to be lined up along the length of a couch, all in a docile row for at least as long as it took Rydet to make her picture. Rydet would further document a physical living space itself, perhaps concentrating on a house and property’s architectural boundaries (windows, door frames, timbered walls, perimeter fences) or an interior’s quotidian accumulation of possessions both decorative (a row of religious portraits forming a sort of seraphic cornice, wedding photographs, patterned wall hangings, elaborate frescoes applied to stoves) and practical (chamber pots and washtubs peeking out from beneath beds, jars of pickled this and that stacked on a corner table). Inhabitants inform our understanding of an interior, a bell-jar habitat. An interior tells us about its inhabitants, offering us clues as to the who and when; cross-sectional dioramas speak of a time and a place, a family’s shared history, a widow or widower’s past lives, a child’s roots. The “Sociological Record” therefore extends beyond the realm of visual art; information embedded between its stratified layers continues to be of scholarly relevance to researchers in other disciplines: anthropologists, ethnographers, sociologists, cultural theorists, and so on. Spanning parts of three decades, Rydet’s “Record” reflects and refracts, with a meticulous eye for detail and social textures, the changing nature of Polish domestic realities both before and after the seismic political transformations leading up to 1989 and the collapse of Communism. A banner headline or sweeping sociopolitical narrative, after all, loses historical weight if it isn’t grounded in the sort of diurnal minutiae underpinning Rydet’s “Sociological Record” tableaux. Up until this point, the public has, in fact, seen only a small, fragmentary portion of the entire “Record.” The (planned) comprehensive digitization and curation of some 16,000 (not a typo!) negatives therefore represents a foundational first step toward the long-term aim of continuing to disseminate Rydet’s work both within Poland and abroad. The shedding of analytical light upon previously overlooked portions of the “Record” will simultaneously allow for evolving interpretations of her project, process, and enduring legacy. Initiated and spearheaded by the Foundation for Visual Arts, the Rydet archival project will weave together the combined and overlapping efforts of multiple cultural institutions jointly committed to the preservation of Rydet’s artistic achievements: the Zofia Rydet Foundation (responsible for maintaining the physical Rydet archive itself), the Museum in Gliwice, the Foundation for Visual Arts, and the Museum of Modern Art in Warsaw. In 2013, we began the initial process of digitizing and archiving more than 7,000 negatives; the result of our ongoing endeavors first became available to the public, via the zofiarydet.com web portal and online database, in December 2013. The archive will additionally be supplemented over time by the online publication of a collation of relevant source material concerning the project, including previously unpublished letters written by Rydet herself. In 2015/2016, The Foundation, in collaboration with Museum of Modern Art in Warsaw, organised an exhibition entitled „Zofia Rydet. Record, 1978-1990″, which offered the largest presentation thus exhibited of Zofia Rydet’s monumental photographic project „Sociological Record”. The next stages for the project will include the hosting of an academic conference at the Museum of Modern Art in Warsaw (slated to be held in January 2016); the publication of a monographic album synthesizing the results of the digitization project with a specific focus on hitherto unexamined segments of the “Sociological Record” cycle (to be published by the Museum in Gliwice). For further information and developments over time, please continue to refer to the project’s zofiarydet.com portal.